The Big Five tech companies (Amazon, Apple, Facebook, Google, and Microsoft) have different means of earning income. Here’s a look at how each of these tech giants make money. Online stores, aka its famous website (and presumably other digital vendors they own, such as Comixology), making up 53% of its total revenue. Retail third-party seller services, aka the Amazon Marketplace, making up 18% of revenue. Amazon Web Services (AWS), its cloud computing/server hosting platform used by many companies; it makes up 11% of Amazon’s revenue. Amazon’s purchase of Whole Foods and push into the brick-and-mortar sector also seems to be doing OK. Those sectors made up 7.4% of Amazon’s revenue, a large increase over 2017. Apple earned $265.6 billion in revenue for 2018. 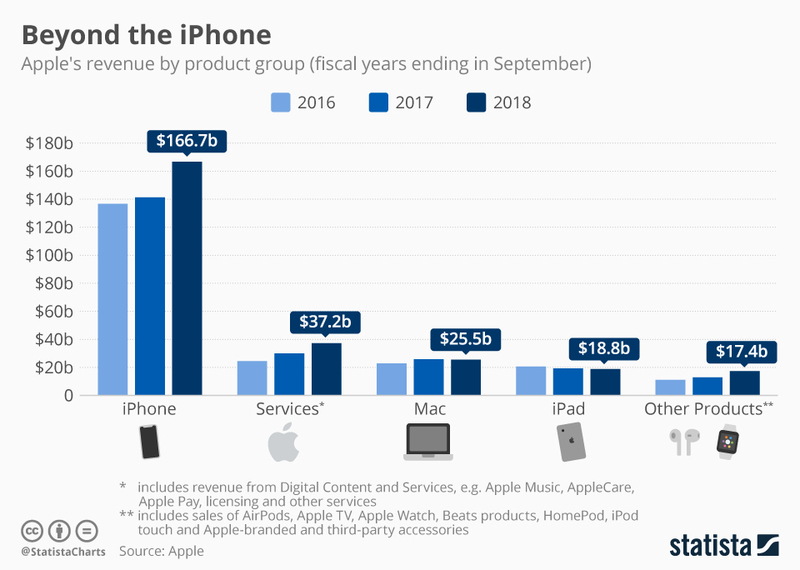 I wrote last fall about Apple’s earnings, but to summarize, here’s an infographic outlining their 2018 fiscal year. As you can see, Apple makes nearly two-thirds of its income from iPhone sales. Apple Music, iCloud, and other items falling under “Services” place a distant second. That’s followed by: Macs; iPads; and “Other Products” (the Apple Watch, AirPods, etc.). Facebook reports that for 2018, they earned $55.8 billion in revenue, up 37% from 2017. That’s the smallest amount among the Big Five tech companies. A whopping 98.6% of their revenue comes from advertising; 92% of that comes from mobile advertising. This might be why Facebook places a big emphasis on its various apps. 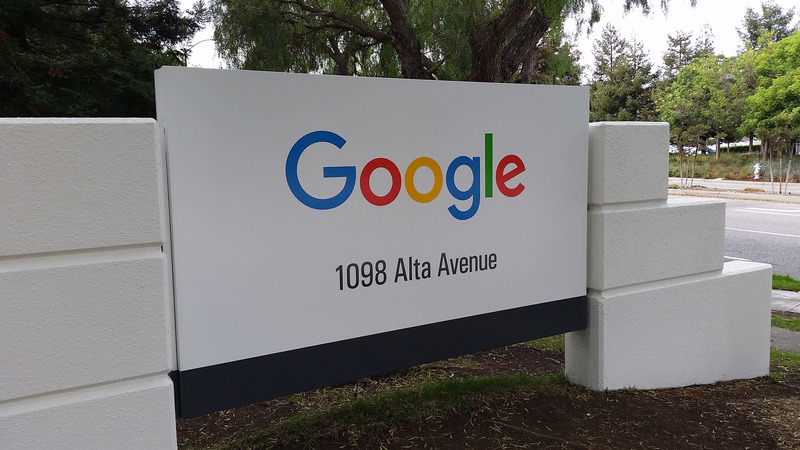 Alphabet (Google’s parent company) reported it made $136.8 billion in revenue for 2018, up 23% from 2017. 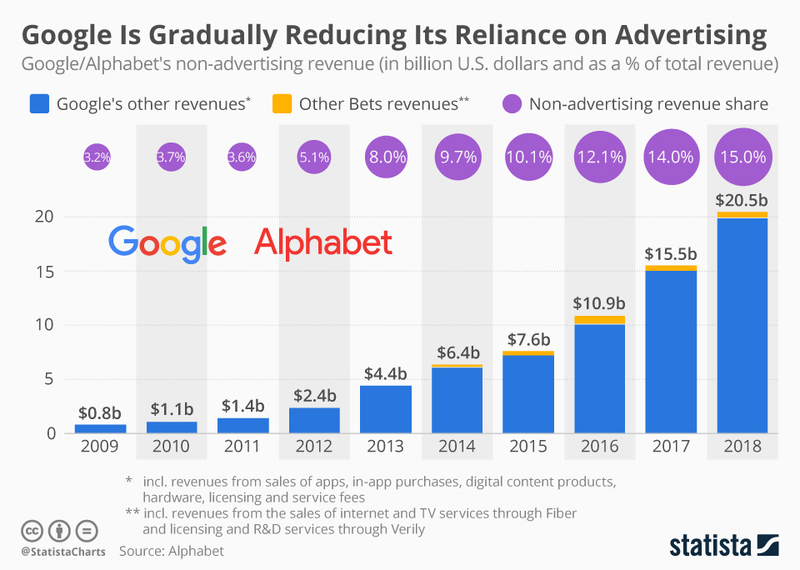 Of this, 85% of its revenue comes from advertising; the other 15% comes from Google Play sales, hardware sales, etc. Here’s an infographic showing its non-advertising revenues have grown over the past decade. More Personal Computing: 38% of revenue. Said category includes Windows, the Xbox, Surface tablets, and search advertising revenue (presumably the Bing search engine). Productivity and Business Processes: 32% of revenue. This includes the Office software suite and related services (Office 365, etc. ), plus LinkedIn. Intelligent Cloud: 29% of revenue. This includes Microsoft’s cloud computing and server businesses. Overall, most of the Big Five tech companies have diverse revenue streams. Apple, Microsoft, and Amazon make most of their revenue by offering consumers various hardware, software, and services (retail, etc.). Meanwhile, Google and Facebook are heavily or near-exclusively reliant on advertising for income. This might explain those two companies’ multiple problems with privacy and advertising issues, especially with the European Union.